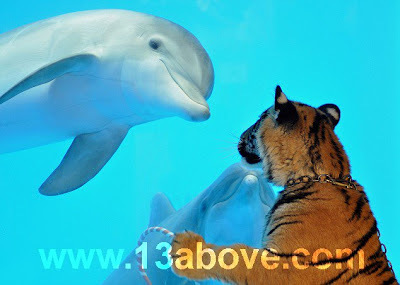 13 Above: Cutiest Love Story - A Dolphin Fallen In Love With A Tiger !! 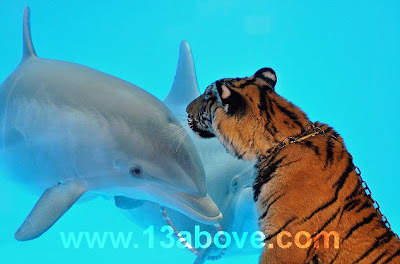 Cutiest Love Story - A Dolphin Fallen In Love With A Tiger !! They would never meet in the wild. So perhaps it's natural that when their paths did cross, both were curious. 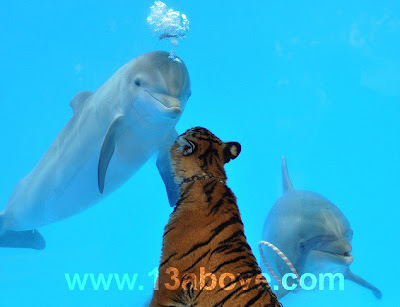 This young tiger and dolphin were mutually fascinated as they stared at each other through the glass of the tank at Six Flags Discovery Kingdom in California. Paws for thought: Mavrick and Akaasha have a close encounter as another dolphin looks on. The pair examined each other from all angles possible - then Mavrick the dolphin blew an approving bout of bubbles at Akaasha, the Bengal tiger. Staff were taking Akaasha, who is a six-month-old female tiger cub, on her daily walk around the theme park when she noticed Mavrick, who is a 14-month-old Atlantic bottlenose dolphin yesterday. Mavrick cocked his head as Akaasha strained to get closer to the glass, perhaps bewildered as to why she could not catch the scent of this strange new creature grinning at her from another world. It may be the start of a beautiful friendship. Nice to meet you: Mavrick blows an approving bunch of bubbles at the entranced tiger cub..
Dolphins are really great and kind animals in the planet Earth.